Glenfarclas 105, is a strong Single Malt at 60° ABV, presented in a beautiful pack that includes two 5cl miniature bottles of the 15 and 21 year-old versions of Glenfarclas. 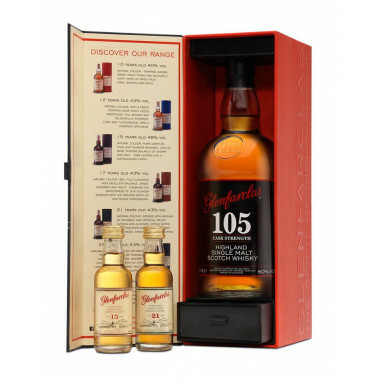 This expression is commonly called "105" : it reunites hallmark flavours of the Glenfarclas range in one glass. Smoky notes appear over a remarkably mellow texture. A drop of water brings out all the tasty flavours of Glenfarclas 105, bottled at cask strength. Amongst the few genuinely independent Scottish distilleries, Glenfarclas is the most envied for its autonomy. Since 1865, the history of Glenfarclas has been deeply intertwined with the history of the Grant’s family. On June 8, 1865, John Grant became tenant of the Rechlerich farm and bought the Glenfarclas distillery, founded in 1836, for £511.19. Today Glenfarclas is one of the few entirely independent family-run distilleries. Whiskies produced by the distillery are widely recognized by the discerning palates and ranked amongst the first Speyside whiskies. The Grant’s family motto, today represented by the 5th and 6th generation, is to create “a pure and perfect Scotch Highland whisky in the traditional Speyside style”. The name Glenfarclas means “the valley of the green grass” and the distillery is located about 1.5km away from the Spey, near Marypark village. Glenfarclas kept the same stills than those used back in 1836 : 6 stills amongst the biggest of Speyside. The Sherry influence is remarkable: Glenfarclas has uncompromising values when investing in the best Sherry casks, and owns today near than 68000 casks, ageing in 32 different warehouses. These are Spanish casks of Oloroso and Fino Sherry, charred so as to coax out all of the vanilla flavor and sweeten the whisky. Glenfarclas has been developing vintage casks every year since 1952 until today. Each vintage reveals unique character and aromas, from the delicate freshness of a 10 year-old whisky to a sweet 30 year-old Single Malt. The official release of the Family Casks in 2008 made history: the range offers not less than 43 vintage bottlings, from 1952 to 1994, each being single casks bottled at cask strength. In 2016, when participating to the San Francisco World Spirits Competition 2016, Glenfarclas has been voted Best Scotch Single Malt Distillery. 39 experts from the World Spirits Industry rewarded the Glenfarclas Distillery with 6 medals attributed to various whiskies. Nose: woody, complex with pear and apples aromas and a caramel overlay. Palate: dry, quickly developing a spicy richness bind to oaky notes and a hint of candied fruits. Finish: astonishing mellow for such a powerful spirit, pleasantly warm with lingering, round smoky notes.